The basic design of LZ-129 Hindenburg was conventional, and based on time-tested technology used by chief designer Ludwig Dürr and the Zeppelin Company for decades. The ship was built with triangular duralumin girders (bright blue from protective lacquer) forming 15 main rings, connecting 36 longitudinal girders, with a triangular keel at the bottom of the hull, an axial corridor at the center of the ship, and a cruciform tail for strength. Hindenburg was originally designed to be operated with helium but the United States had a monopoly on the non-flammable gas, and the Helium Control Act of 1927 prohibited American export of helium to any foreign nation. For a discussion of LZ-129’s flight instruments and flight controls, visit the sections on Hindenburg’s Control Car and Hindenburg Flight Operations. One importance technological advance was the ship’s very shape and dimensions; although only about 30 feet longer than Graf Zeppelin, Hindenburg carried about twice the volume of lifting gas, due to its larger diameter and “fatter” profile. Hindenburg’s thicker shape also gave it greater structural strength against bending stresses, as compared to the thinner profile of Graf Zeppelin. The ability to build a ship with a much thicker profile was due to the construction of a new, larger shed at Friedrichshafen in 1929-1930 (see photograph below), which had been financed by the German national government and the State of Wurttemberg. The construction sheds at Friedrichshafen. The older Factory Shed II, whose height limited the dimensions of Graf Zeppelin, is on the left, and the new larger shed which allowed construction of Hindenburg is on the right. The height of the previous construction shed had limited the dimensions of Graf Zeppelin (resulting in that ship’s thin profile and the very forward placement of Graf Zeppelin’s passenger gondola, to maximize use of the ship’s diameter). The new shed allowed the construction of much larger airships, which could carry the greater volume of gas necessary to lift the payload required for profitable scheduled transatlantic passenger service. One innovation aboard Hindenburg was the use of a new material for the construction of the gas cells. While gas cells for earlier German zeppelins were made of goldbeater’s skin (the outer membrane of cattle intestines) the cells aboard Hindenburg used a new material, similar to that used by the Americans, which was made by brushing layers of gelatine onto a sheet of cotton; this gelatine film was sandwiched between two layers of cotton to create the fabric for the cells. Hindenburg’s gas cells had 14 manually-controlled maneuvering valves located just above the axial walkway, which could be operated from the main gas board in the control car; electric meters measured the fullness of each cell and could be monitored in the control car. Hindenburg was also equipped with 14 automatic valves which released gas whenever cell pressure became too high, to avoid damage to the cells themselves or to the framework of the ship. Hindenburg’s Daimler-Benz engines were also rather advanced, based on the MB-502 engine designed for German E-boats (high-speed motor torpedo boats) as part of the Nazi’s rearmament program. Each of Hindenburg’s four LOF-6 (DB-602) 16-cylinder engines had an output of 1320 hp @ 1650 RPM (maximum power), and 900 hp @ 1480 RPM. The normal cruise setting was 1350 RPM, generating approximately 850 hp, and this setting was usually not adjusted during an ocean crossing. The engines were started with compressed air, and could be started, stopped, and reversed in flight. Using 2:1 reduction gearing, each engine drove a 4-bladed, fixed-pitch, 19.7′ diameter metal-sheathed wooden propeller (created from two 2-bladed props fused together). The engines were mounted in four engine cars; two at Ring 92, and two at Ring 140. To protect the ship’s fabric covering, the engines which were angled slightly away away from the hull so that the their propeller wash would not directly strike the ship’s covering. The rear engine cars were mounted lower on the hull than the forward cars, so that the propellers of the rear cars would operate in clean air, undisturbed by the propwash from the forward engines. A mechanic was stationed in each engine car at all times to monitor the diesel and carry out engine orders transmitted from the control car. An innovative feature of the Hindenburg was the ship’s Anschutz “auto-pilot”, which used a gyroscopic compass to control the rudder and elevators, and keep the ship on its assigned course and altitude during cruise in stable weather. But Hindenburg’s potentially most innovative features were never actually implemented. Hindenburg was originally designed for helium, which was too difficult to obtain and too expensive to be vented to compensate for the weight of fuel burned during flight. To avoid the need to valve helium, several innovative solutions were proposed. One involved a set of inner hydrogen gas cells to be installed at center of 14 of the ship’s 16 helium cells. The flammable hydrogen would be protected inside the larger cell containing inert helium, and when it was necessary to valve lifting gas, hydrogen, rather than helium, could be released. 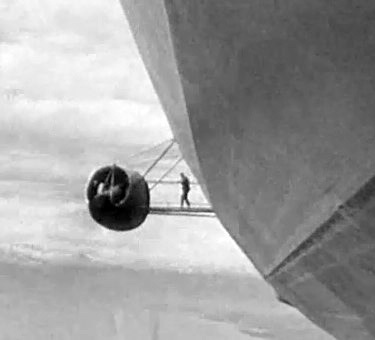 When it became obvious that helium would not be made available by the Americans, and that the ship would be inflated with hydrogen, the inner cells were abandoned, but Hindenburg did retain the axial catwalk at the center of the ship that was installed to provide access to the valves for these inner cells. The second proposed innovation involved a water recovery system which would have used silica gel to capture water from engine exhaust, obtaining water ballast to partly compensate for the fuel burned by the engines. This system, too, was abandoned when the Zeppelin Company was unable to obtain helium and it became necessary to inflate Hindenburg with hydrogen. Consideration was also given to installing engines which could burn hydrogen, but tests indicated that such engines had a much more limited power output; the maximum power that could be obtained was approximately 300 hp. Plans were drawn to add a fifth engine gondola to compensate for the lower power of hydrogen-burning engines, but these plans were never implemented. One other innovation which was briefly attempted was a plan to recover and launch fixed-wing aircraft to speed the delivery of mail. Test were conducted in which famed German ace and Luftwaffe official Ernst Udet attempted to hook an aircraft onto Hindenburg in flight, but these attempts were not sucessful, and no such system was developed before Hindenburg’s crash in May, 1937. Did the Hindenburg use welded or riveted internal trusses? Was the Hindenburg made out of a type of foil? Great corrections; my terminology was sloppy and I appreciate your comments! I will try to update the text itself when I get a chance. Pardon me, I stand corrected, ” The HINDENBURG LZ–129 “, and the ” LZ–134 MANFRED VON RICHTHOFEN “! hi robert. enjoyed your comment. call me sometime. i am an avid airship researcher. been researching and collecting memorabilia for over 27 years.